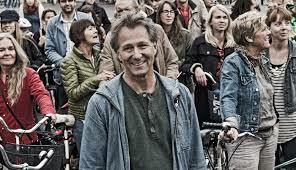 Bikes vs Cars is an impressive documentary from Swedish director, Fredrik Gertten. We caught up with him while he was in the US for the film’s North American debut at the SXSW Film Festival in Austin, Texas. 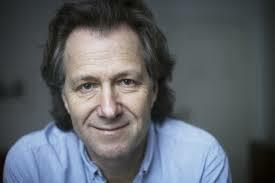 Gertten, a seasoned filmmaker, co-produced the 2010 Academy Award nominated documentary, Burma VJ, which centers on protests against the military regime in Burma. He directed the film Bananas!, the story of a class-action lawsuit by banana workers in Nicaragua that targeted the Dole Food Company. The film incited Dole, one of the world’s largest food companies, to sue Gertten for slander. The film Big Boys Gone Bananas! was a natural progression in telling the story of Dole’s lawsuit against him, which he eventually won. Bikes vs Cars speaks to similar topics as in his Banana films − big business (mainly car manufactures and car advertising) versus the bicycle rider lifestyle. Speaking with Gertten between breaks in the action at SXSW was informative, as he has plenty to say about this frustrating topic, one in which he does shed a bright spotlight. Kathrine LeBlanc: Can you tell me a little bit about why you are passionate about this topic and the inspiration for the film? Fredrik Gertten: First of all, I have always been very interested in city planning and architecture, so I’ve been doing several shows [films] about that too, but as a filmmaker, you look into many different stories that are in many ways close to your life, and I come from a city where the bike is something very natural. It’s not a political statement. Getting on a bike is just something I do. It’s been like that all my life and it’s a bit frustrating in cities, traveling the world that there is a lack of bicycles. Suddenly, I see bicycles coming back to cities all over the world. Of course, I see that there is something going on here. I thought it is interesting to look into. KL: The next question is how do you make it a film? You can’t always make your love affair into a duel; it has to be a little bit more. FG: Did you see my last show [film], The Big Boys Gone Bananas!? KL: You know, I haven’t, but I did read about it and was the information about pesticides and that was quite shocking as well. FG: The film is about why I got sued for my previous show [film] called Bananas!. I was looking into the PR industry, not journalists; they are trained journalists, but they work for companies. It’s the industry of selling messages. For me, it was very interesting to see the bicycle movement and people that work in difficult cities [not bike friendly] to know what they’re up against– a very strong machine who has investments in car sales and lobbyists. There are politicians who try to make their cities better [bike-friendly]; there are also a lot of forces that don’t like that. I think in this film, we look into those forces because I think if we want to change as a society, we need to understand the issue. KL: Yeah, absolutely. I saw that there were some notable stats in the film too around that in that bike community in the US has grown by over fifty percent in the last decade, while in China bike use has dropped by forty-five percent. Do you see that dynamic starting to shift? FG: This is interesting because there are obviously two parallel things going on right now. Many cities are becoming more livable and more bike-friendly because the new modern generation, who make their money, sometimes very good money from different startup companies, they are really flexible people. They don’t want to sit in traffic. They now come into cities that are better for them. For example, my city of Malmo [Sweden], which is a very small town, is rated by Forbes’ magazine as the fourth most innovative city in the world. We are extremely bike friendly. The same goes for our neighboring cities: Copenhagen and Amsterdam. You can see that happening here in Austin [Texas]. Cities that attract young people will also be more bike-friendly because this new generation thinks it is extremely old-fashioned to sit in traffic. FG: That is just one thing going on; the other thing is that car sales have been booming all over the planet. The population of China is growing a lot. The consuming middle class is also growing. In many, many countries, people do what we have been doing already. They copy us. They buy cars and they buy a suburban house. Then, they get stuck in traffic. That’s the other side of it. There’s two things … More and more cities are becoming more livable, and the bicycle use is rapidly growing. Many politicians see the bicycle as a tool also to make their city more attractive. KL: Absolutely, I see that in my city of Denver. A lot of these suburbs are trying to retrofit for bikes, so they’re building the bike lanes along the highway, but it’s still a fifty-mile commute for some folks. Shifting gears a little bit, I noticed the film follows such a diverse group of passionate people from the bike activist in Brazil to a taxi driver in Copenhagen. How did you come up with the group of individuals you chose to follow? FG: That’s always a challenge because when you start to write in Brazil, you don’t know the people. I knew that I wanted to tell this global story through small stories, by individual stories, stories that in themselves carry a global pattern. I knew that I wanted to do something in L.A. because L.A. is the place where this kind of model is produced. Luckily, I knew about that couple who’s in all these stories in the film. In order to be a good storyteller, you have to tell small stories that really represent, makes you understand what happened, in a way. I knew that I wanted to have a female lead in the film, a young lead, so not a bicycle veteran. I didn’t want a scarred veteran. I wanted to have someone who was still attempting a process. The bicycle movement is not only a political movement. It is people who just left a car. Through the bike, they get new friends. It’s more like a party hangout than a political movement. Of course, it is dangerous out there. When they organize, they become a political movement. I think that I wanted to have someone coming in for joy but then moving on to something more, somebody involved in city politics. I was looking for different bloggers and Twitter handles. These things make it easy because you can find people. FG: I found a girl named Aline Cavalcante. She was blogging, then I Skyped with her. On Skype, you can get the feel of whether she is a good storyteller or whether she’s good on screen or not. I said, “Wow, this is interesting!” I did a test showing. Then I said, “Wow, let’s go!” Then we kept filming her. I tried to do the same on the other things too. KL: Yeah, that’s great. She’s certainly got that fire under her seat and that passion that makes for a great story. Finally, what are you hoping audiences take away from Bikes vs Cars? To understand that the cities that we have today are man-made with man-made problems; that can also be changed. It is not a natural development. I hope people come out and say, “Wow, cities are made by people, then we can also make them better.” That’s what I want people to think. Of course, as a filmmaker, I want people to use my film. This film is not about Denver; it’s not shot in Denver, but it’s also about Denver. I think it can be used for local debates everywhere. KL: Great. Thank you so much for your time today and for creating this wonderful film. I wish you all the best of luck with it. FG: Thank you very much.